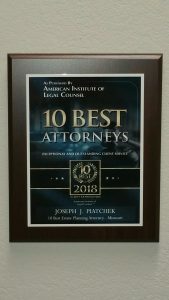 Managing Attorney Joe Piatchek is proud to accept this award from the American Institute of Legal Counsel, recognizing him as one of Missouri’s best Estate Planning attorneys. Although Joe has career experience practicing all types of law, helping clients learn about the Estate Planning process is a personal favorite practice of his. Both clients and the American Institute agree that his unique of approach blending Ozark friendliness with professional experience sets his work apart. Only at the Piatchek Law Firm will you find this caliber of legal services provided by such a down to earth staff. Next time you need to update your Estate Planning documents, or if you’ve been putting off setting up your Estate Plan altogether — or maybe you just have some questions and want to learn more about your options, give Joe a call and see for yourself why we are one of the state’s best law firms.